Ayr United have had an appeal turned down to have their five-times postponed Scottish Cup tie against Lochee United switched to a neutral venue. The latest call off came on Monday afternoon, a frozen pitch putting paid to the planned 1345GMT kick-off, and the clubs will try again on Wednesday. 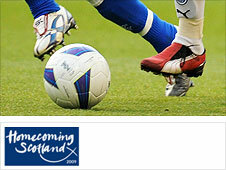 Ayr's website stated: "We have appealed to the SFA to have a rethink about playing the tie on a neutral venue. "But the SFA remain steadfast that Lochee has to host the tie." The match, originally planned for Saturday 29 November, will take place either on a Monday or Wednesday, including 24 and 31 December, from now until it is played to a finish. Although already postponed five times, the tie is a long way from making history, Airdrieonians' home clash with Stranraer in 1963 having been rearranged 33 times before it was eventually played. Second Division side Ayr are hoping to overcome their Junior opponents to set-up a local derby. Kilmarnock are already through to the fourth round and await the winners of the tie, who will play host to the Scottish Premier League side. The third-round replay at Dalbeattie Star's Islecroft Stadium beat the freeze on Monday afternoon, with Forres Mechanics progressing 4-2 after extra-time. The Highland League side face the winners of Monday evening's match between Forfar Athletic and Stranraer. Dumbarton host Ross County, while Elgin City host Spartans in Monday's other games. Forfar's Station Park and Elgin's Borough Briggs both passed lunchtime pitch inspection.